Universal Monsters™: The Phantom’s Curse | Top Slots @ Vegas Spins! NetEnt presents Universal Monsters: The Phantom’s Curse Slot at your favourite online casino, Vegas Spins! With this 5-reel, 40-payline slot, learn about a musical known as The Phantom of the Opera. As per the tale, Erik who is a ghost and musical genius fall in love with Christine Daaé, a pretty soprano singer. Step into the huge opera hall to relive this incomparable love story! On the transparent reels, find several symbols such as the Phantom, Christine, Ring, Yellow Flower, Mirror, Dagger, Heart, Spade, Club and Diamond. Experience this unique atmosphere on any desktop and mobile device. 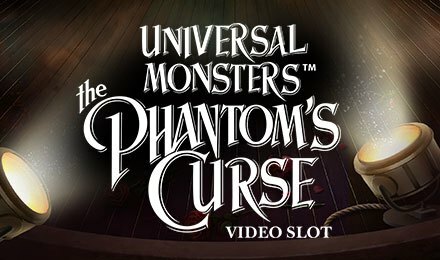 Learn more about this unique love story on Universal Monsters: The Phantom’s Curse Slot! Start setting your preferences using the + and – buttons on the Coin Value and Level displays. Press the Max Bet tab if you want to select the highest stake. You can also launch a given number of rounds that are played hands-free with the Auto Play option. Bet Levels: A maximum of 10 levels is at your disposal. Amount of Paylines Selection: All 40 paylines cannot be adjusted as they are active during any round. Coin Values: The following coin values are available; £0.01, £0.02, £0.05, £0.10, £0.20, £0.50 and £1.00. When the Unmasked Stacked Phantom appears on reel 1, together with a stacked Christine icon on the 5th reel, the Point & Click Bonus round becomes active on Universal Monsters: The Phantom’s Curse Slot. It is mainly a picking game consisting of 2 stages. During the first stage, choose any of the 8 roses to uncover coin wins until the blocker triggers the next stage. During the second one, select from 3 mirrors to win a maximum multiplier of 3x. In this way, you can receive up to a whopping 7200 coins! Land an Unmasked Stacked Phantom 2 positions high on reel 1, as well as a Stacked Wild Mask on the 5th one to activate the Masked Phantom Re-spin feature on Universal Monsters: The Phantom’s Curse Slot. Here, all Wilds, Phantoms and Bonus symbols stay in place for a free re-spin during which they become Wilds. You must be wondering about the lovely chandelier on Universal Monsters: The Phantom’s Curse Slot. It is the Scatter symbol which helps in activating free spins. When 3 scattered Chandelier symbols land on reels 1, 3 and 5, you can trigger an unlimited number of free spins! During the Free Spins round, each reel is connected to the arm of a chandelier. When the Masked Phantom lands on a reel, the latter is highlighted. When this occurs, the round ends. The Masked Phantom also acts as a Wild and appears stacked on any highlighted reel. Have you noticed the Mask on Universal Monsters: The Phantom’s Curse Slot! It is the Wild icon which substitutes for any symbol apart from Scatter. Notice how other symbols also act as Wilds during the game. Kick off the fun by launching Universal Monsters: The Phantom’s Curse Slot at Vegas Spins! Wish you good luck!